We had heard that holding was poor in Pirate’s Cove, and that anchors had a tendency to drag, but we were snug with our well-set anchor and stern tie. It was a hazy, cloudy morning, and we were in no hurry to move along, so we took the dinghy over to one of the two dinghy docks to hike a bit. Pirate's Cove complete with a treasure chest. Someone took the time to hand paint the welcome sign at Pirate's Cove. 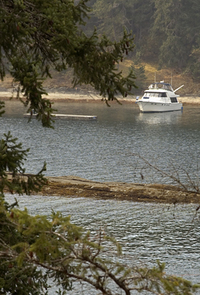 Pirate’s Cove has been a marine park since 1966, and it has wonderful trails that are easy to walk and really pretty. We walked to the other side of the island where some kayakers were making camp. There are nice campsites and I am always amazed how clean the outdoor toilets are and how there’s always toilet paper. Guess those park hosts keep pretty busy. The B.C. parks maintain a nice infrastructure. 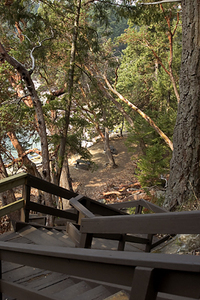 Take a look at these nice stairs to a campsite on a beautiful little bay. We went back to the boat and decided to depart. It was a bit crazy again, as the wind wanted to blow us into the concrete park host floating dock while we scurried to haul in the stern tie and get the anchor up. Captain Bob came through again, and off we went, back through the tricky entrance (at low tide you can really see those dangerous reefs) and out into deep water again. Best of Times in Pirates Cove. 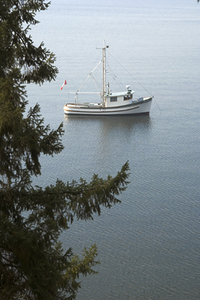 Trawler enjoying a peaceful, secluded anchorage on the south side of the island. Our agenda was to stop at Wallace Island, a favorite from our last trip. I had decided that we’d anchor in Princess Cove and have lunch aboard before doing some exploring. Another shallow and interesting entrance behind us, we snagged a great spot to anchor and had lunch while we watched other boats come and go. It was fairly low tide, so it seemed like a great time to kayak. The kayaking was just so-so until we noticed the rocks that are part of the reef guarding the entrance to Princess Cove. As we headed that way, we heard lots of snorting. Yes, there were seals! We were able to get within 75 feet or so of a bunch of seals sunning themselves on the rocks. The younger ones were a bit unsure of us, but the two big bull seals just stared at us with pretended indifference as we snuck closer (“snuck” being a tough thing for a bright yellow kayak to do). The seals were really funny, they liked to swim near and check us out, and then zip away to a safe distance. We even saw one seal get a mouthful of water and spit it directly onto another one’s face. Just like kids! We headed to Prevost Island and Glenthorne Passage for the night. I was anxious to check out this anchorage as we had enjoyed Annette Inlet earlier in the trip. The anchorage was absolutely lovely and there were only 4 boats at the head of the cove. Quiet and peaceful, it was a lovely evening.